GENEVA - Nearly five hundred people crowded the commons area at Geneva High School last spring to network with local business owners, to reconnect with friends and neighbors and to sample chocolate in every imaginable permutation at Geneva Rotary’s annual Chocolate Fest and event organizer Terri Vincent said she expects a big turnout again this year. Chocolate Fest patrons buy a $5 ticket, which provides them with a takeout box and five chocolate samples of their choice from any business. More than thirty vendors have already staked out tables for this year’s event and will showcase spectacular floral arrangements, business services, specialty foods, handmade jewelry and unique gifts. Vincent explained that the core focus of the Chocolate Fest is community support. “The money raised always goes towards a community project selected each year,” she said. Vincent said The Fest has provided funding for youth soccer and baseball fields, the pavilion on Main Street and walking trails, and bolstered the Share a Christmas Program organized each holiday season by Geneva Area Safety Forces. The club also supports Geneva High School students by providing scholarships to college-bound seniors, sponsors the Breakfast of Champions to honor the top 100 GHS students, the annual Rotary 4-Way Speech Contest and sends student delegates to the Rotary Youth Leadership Seminar. Funds raised by the this year’s Chocolate Fest will support the University Hospital/Geneva RotaryLife Skills/ Life consequences education program. “This program is being provided to Geneva High School students to help with the war on drugs and other problems facing our youth,” Vincent explained. 2019 Chocolate Fest vendors include Upscale Eats, T and D Candles Party Lite – Tom and Doug, Mary Kay Jodi Acierno, Country Club Rehabilitation, Do Terra Essential Oils – Christina Lewis, Andover Bank, Tupperware Angela Beck, Lime Life by Alcone –Marcy Brennan, Earth’s Natural Treasures, Bouts and Bouquets Flower Shop, UH Geneva Medical Center, Key Bank, Coldwell Banker Hunter Realty, Luisa’s Mexican Grill, Earth’s Natural Treasures, UH Geneva Medical Center, Key Bank, Rae Ann Nursing & Rehabilitation Center, Pampered Chef – Alicia Etzel, Sanctuary of Geneva, HAN Creations Heidi Novosel, Avon Sarah Retkofsky, Love 4 Legos Jewelry Valerie Bosch, YMCA, Cup Cake Ladies Theresa Maki, Pink Zebra –Cindy Goff, Tastefully Simple Karen Gridley, Heather’s Pure Delights, Geneva Parents for School Safety, Thirty One Gifts Carmela Poggemeyer, Trice Chiropractic Clinic, Personal Chef Service by LPD, Lisa Summers Attorney at Law, LLC and Designs by Crystal. Sponsors for the event include UH Geneva Medical Center, HuffmanMayer Wells Fargo Advisors, Waste Management, Crawford Insurance Agency, Fraternal Order of Eagles Aerie 2243, Cope Equipment, Ashtabula County Medical Center, Northwest Savings Bank, Loudermilk Tractor & Cycle, Beverage Depot, Quality Imaging Solutions, Rosemary’s Pizza and Mary’s Diner. Fans of the Roald Dahl classic, Willy Wonka and the Chocolate Factory, will have the opportunity to meet the iconic chocolatier in person at Geneva Rotary’s Chocolate Fest this year. 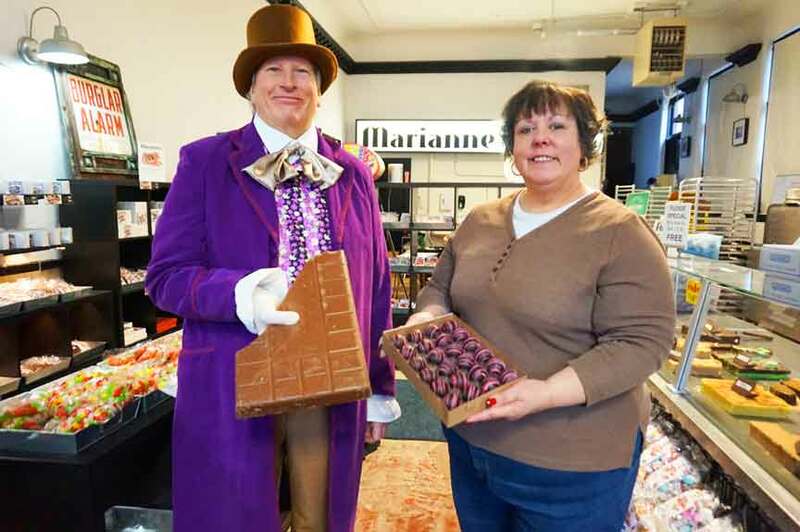 Willy Wonka, portrayed by Mac Chafer, Manager of Coldwell Banker Hunter Realty’s Geneva and Mentor Offices, will make a special appearance at the thirteenth annual Chocolate Fest organized by Rotarian Terri Vincent (pictured). The Chocolate Fest will take place on Tuesday, March 19, from 5:30 until 7:30 p.m. in the Geneva High School Commons. A limited number of vendor spaces are still available and sponsors are still needed to support the fundraising effort. For information, contact Vincent at 440-813-4417. Funds raised by the 2019 Chocolate Fest will augment the University Hospitals and Geneva Rotary Life Skills/Life Consequences education program.